MORGANTOWN, W.Va. (AP) — Freshman forward Kevin Knox scored 19 of his season-high 34 points in the second half and Kentucky overcame a 17-point deficit to beat No. 7 West Virginia 83-76 in the Big 12/SEC Challenge on Saturday night. Knox offset a strong performance from Jevon Carter, who finished with 26 points for West Virginia (16-5). James “Beetle” Bolden added 17 points and Sagaba Konate had 13 points and seven blocked shots for the Mountaineers. West Virginia led for most of the game but fell quiet after halftime. Knox scored 12 points during a 21-2 run, capped by his dunk with 10:39 left for a 58-56 lead. Bolden, a Kentucky native who said he had been waiting for this opportunity to play his home-state school, hit a 3-pointer to tie the score at 74 with 1:23 left. But West Virginia didn’t make another basket. Knox’s 3-pointer with 1:05 remaining put Kentucky ahead to stay. Nick Richards dunked off a rebound with 30 seconds left, and Quade Green and Wenyen Gabriel each sank two free throws after that to seal the win. 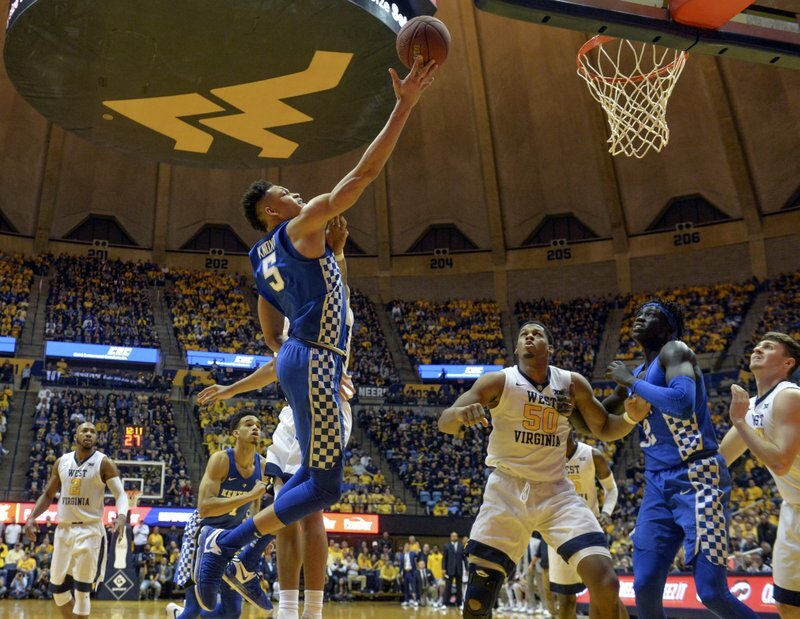 It marked the third time in five games that West Virginia has blown a double-digit lead in the second half. Kentucky: The Wildcats beat a ranked team for the first time this season and have won two straight since dropping out of the AP Top 25 last Monday for the first time since March 2014. West Virginia: The Mountaineers have lost two straight and four of their last five games after being ranked No. 2 two weeks ago, their highest ranking since December 1959. Kentucky: Hosts Vanderbilt on Tuesday. West Virginia: Plays at Iowa State on Wednesday. The Mountaineers have lost two straight Big 12 road games. 0 Response to "Knox scores season-high 34, Kentucky beats No. 7 WVU 83-76"